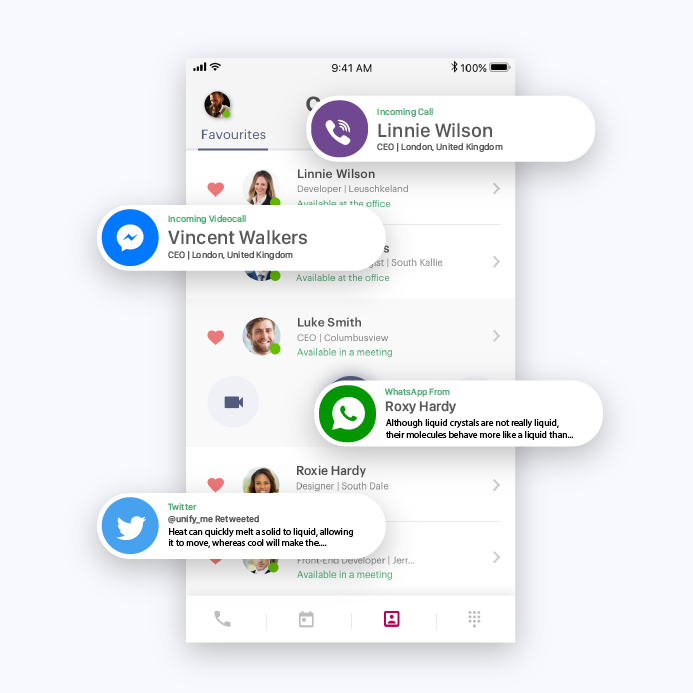 Features — Unifyme "Unified communications as a service for Small Business"
Increase the efficiency, connect remote teams, and establish relationships! UnifyMe is entirely cloud-bases unified communications tool. We provide you with reliable and affordable software available from every location and device. Easy to deploy, no hardware needed and no complexity. UnifyMe cloud communications saves you time and improves your business. UnifyMe allows you to combine communication through different channels in the same multi-platform tool. All the communication needs that a company has under a single web admin portal for maximum convenience. WeChat, Linkedin, Slack, Telegram, Line and many more from a single place. UnifyMe is designed to make your communications simpler and to save your time. It is easy to start using UnifyMe – you just need a phone or a laptop. All your business communication data is accessible and securely stored in a single place. collaboration processes thanks to the sophisticated analytics features. Subscribe to UnifyMe to discover all the benefits a top-notch cloud communication tool will deliver to your business. Sign up and be part of building a disruptive communication and collaboration solution!